We offer installation to all our customers. 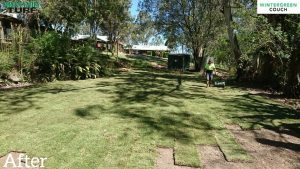 Albert Valley Turf employ’s a team of professional and reliable sub-contractors that can travel to Gold Coast, Brisbane and Ipswich. Upon ordering installation at the time of booking, it is required that the customer is on site at the time of Albert Valley Turf’s arrival. An overview of the site and any instructions that you may have must be dictated to the installers before you leave the site. If you are not available at the day of booking, we require a family member or friend to be able to show the site to our layers and discuss any issues that may arise. All preparation work MUST be completed before the time of your delivery and installation booking. 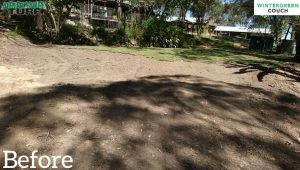 This includes all existing lawn removed, undersoil levelled and the area is clean and free of any debris. Our sub-contractors will not level on the day and will lay turf on the site prepared. Preparations work completed by the person in charge must be done to an adequate standard. The driver will inspect all preparation work before any work commences with our layers. Access to the prepared site must be 2.4 m wide to allow our forklift to pallet drop next to site. If access is denied then the turf pallets will be dropped at the front of the property. Any wheelbarrowing or hand carrying of turf will be discussed prior to commencement of laying. If you do not agree with the re-negotiated price the layers will contact the office and a full refund of your turf laying fee will be provided. No refund on the turf will be offered. Any re-negotiated prices will be paid directly to the installers upon completion of the job. If this has not occurred, Albert Valley Turf reserve the right to charge the extra fees to the credit card provided at the time of booking. 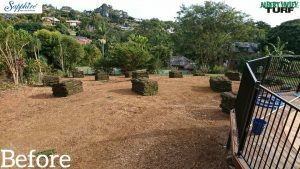 Upon installation of turf it is normal to expect 2- 5% wastage depending on the variety of turf. Any wastage will be kept neatly in a pile and will be disposed of by the sub – contractor. They will not leave any rubbish or debris on the premises after they have completed all works. Once the job has been completed it is the customer’s sole responsibility to water in the turf heavily. An information sheet at the back of your tax invoice will be provided by the driver at the time of delivery. As the turf is a live product we do not accept any responsibility for the turf or the laying after 24 hours after delivery. Honesty and as much information that can be given at the time of booking is greatly appreciated. 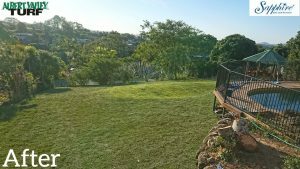 We grow, supply, deliver and install superior turf and grass.